The Plovdiv State Puppet Theatre was founded in 1946. It is a repertoire theatre, budgeted by the Bulgarian Ministry of Culture and actively supported by the Plovdiv Municipality. For the 58 theatrical seasons so far, over 285 plays have been performed. Every year the Puppet Theatre releases five new performances attended on the overage by at least 30,000 viewers. The theatre has toured more than 40 countries and participated in numerous international festivals. Being a winner of over 80 prestigious international and local theatrical awards, the Puppet Theatre has 6 productions recorded in the Golden Fund of Bulgarian National Television. The theatre’s strategy aims at producing valuable repertoire staging addressed to both children and adults. It has kept looking for “smaller” and “more mobile” forms of theatre to comply with the new economic conditions but no compromising was ever done with artistic or aesthetic values. The theatre performances feature a highly professional, dynamic, up-to-date staging, with a fresh and subtle sense of humour and improvising, having nothing to do with the purely commercial production. The Plovdiv State Puppet Theatre is always open to fresh ideas, constructive artistic contacts and national or international cultural cooperation projects, stage arts and theatrical management. It has been successful in producing guest-staging from Bulgaria and abroad, designed for both young and adult audience. In 1977 the Plovdiv Puppet Theatre initiated the organization of An International Review-Festival of the Puppet Miniature, released in annual editions ever after. Since 1990, this event has gained recognition as an international festival under the name of “Three Are Too Many – Two Are Too Few”. The festival aims at presenting the best achievements in the field of “smaller forms” of puppet performances to the experts and the wide audience, as well as obtaining a position of its own within the context of the European puppet theatre festivals. 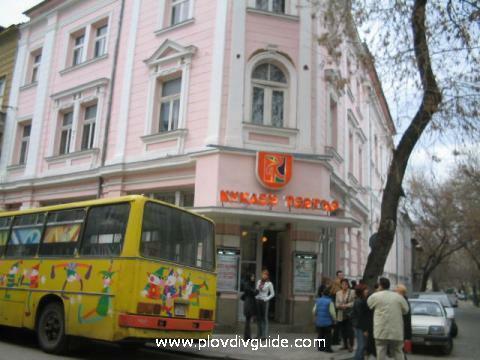 The Plovdiv State Puppet Theatre owns a building featuring two 2 separate performance halls: a chamber one, equipped with 45 seats, and a large one, with 170 seats; as well as a bus and a minibus. The employee staff include 12 actors, a director, a stage designer, a composer and also administrative, technical and maintenance body.